After signing to the Verve imprint of Universal Records last year, former boyfriend/girlfriend yet still longtime Aussie musical collaborators Falls released their ‘Into the Fire’ EP in February 2014. Over a year and a half and a move to Los Angeles later, the duo – Melinda Kirwin and Simon Rudston-Brown – are gearing up to release their debut album this very Friday. Produced and recorded by the legendary Mike Mogis at his Presto! Recording Studio in Nebraska, the album takes its name from the Midwestern town where much of its toughest work was done. Quite a long way from the Hotel Hollywood bar where the pair first cut their teeth playing live in Sydney, where they also played a series of back-to-back sold out shows to devoted fans just 2 weeks ago. Kirwin says of their music, “Our songs are at times deeply personal. They’re raw, they’re real and they’re very honest.” There’s no questioning the duo’s sincerity, as their songwriting on ‘Omaha’ matches the brilliance of their past output seen on such tracks as the beautiful yet catchy ‘Home’. For sure, ‘Omaha’ as a whole sounds rich thanks to the production and string arrangements by Tony Buchen. But as you might expect, working with a superstar producer with a stellar track record like that of Mogis has polished some of Falls’ edges. Whether this professional polish helps or hinders their success outside Australia remains to be seen. 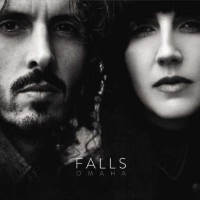 To those who have never heard of Falls before, this album might just be the perfect entry point into their world, which now has an anthemic quality instrumentally that goes well beyond the folk sensibility on which they made their name with in Oz. An example of this is album opener ‘Let in the Light’, floaty in its sweeping, echoey instrumentation, yet feeling too lightweight in the lyrics department (“tell me how you spend your days/ how do you spend your nights / how you do tell yourself it’ll be all right?”). Showing Falls at their poppiest, it’s not hard at all to imagine both ‘Beating Hearts’ and ‘Falling’ being played on daytime Radio 2, the former with an infectious drum beat throughout, the latter showcasing the pair’s faultless harmonies. With its “na na nahs” and strummed chords, ‘Better Way to Go’ is another enjoyable number that should inspire quite a few singalongs at their future gigs. Running on the opposite side of the spectrum are the LP tracks on ‘Omaha’ that speak more directly to the Aussie duo’s musical roots. With charmingly disarming piano chords, ‘Summer’ is a simple ode to homesickness, while ‘Nothing Ever Comes My Way’ is tinged forlornly with regret and loneliness, themes that are returned to on the album’s conclusion and Rudston-Brown’s star moment, ‘Don’t Ask’. ‘When We Were Young’ – said by Kirwin to have been inspired by being in New York City in the middle of winter in early 2014 and imagining the personal stories of the many people they would see on their intercity travels – is conveyed well as a memorable hoedown. An additional tribute to their adopted homeland, ‘Independence Day’ weaves a beauteous story about a lost love and the holiday on which it was written on. While Falls’ classic and simple guitar folk sound may have been embellished on instrumentally through outside influence in some places on ‘Omaha’, it’s Kirwin and Rudston-Brown’s confident storytelling that proves far more important – and satisfying – on their debut album. ‘Omaha’, the long-awaited debut album from celebrated Aussie folk singer/songwriter duo Falls, is out this Friday, the 2nd of February on Verve / Universal. For past coverage on TGTF of the duo, go here.